Award-winning cookbook author Judith Fertig has just released her first novel, The Cake Therapist, combining her expertise in baking with a passion for storytelling. Today I have a delicious treat — an opportunity for one of my readers to win a copy of The Cake Therapist AND Judith’s brand new cookbook, Bake Happy. Claire “Neely” O’Neil is a pastry chef of extraordinary talent. Every great chef can taste shimmering, elusive flavors that most of us miss, but Neely can “taste” feelings-cinnamon makes you remember; plum is pleased with itself; orange is a wake-up call. When flavor and feeling give Neely a glimpse of someone’s inner self, she can customize her creations to help that person celebrate love, overcome fear, even mourn a devastating loss. Maybe that’s why she feels the need to go home to Millcreek Valley at a time when her life seems about to fall apart. The bakery she opens in her hometown is perfect, intimate, just what she’s always dreamed of-and yet, as she meets her new customers, Neely has a sense of secrets, some dark, some perhaps with tempting possibilities. A recurring flavor of alarming intensity signals to her perfect palate a long-ago story that must be told. Cookbook author Judith Fertig grew up in the Midwest, went to La Varenne Ecole de Cuisine in Paris and The Iowa Writers’ Workshop, and now lives in Kansas City. Described by Saveur Magazine as a “heartland cookbook icon,” Fertig writes cookbooks that reflect her love of bread, baking, barbecue, and the fabulous foods of the Heartland. Fertig’s food and lifestyle writing has appeared in more than a dozen publications, including Bon Appetit, Saveur and The New York Times. You can read some of her cookbooks like novels–the fabulously photographed Heartland, the award-winning and James Beard Awards-nominated Prairie Home Cooking (a “tour de force,” says Saveur), the encylopedic All-American Desserts, and Prairie Home Breads. Her IACP Cookbook Award-winning The Back in the Swing Cookbook (with Barbara C. Unell) takes you on a delicious daily journey to get you back in the swing after breast cancer. And one of her books IS a novel, her debut The Cake Therapist (June 2015), the story of a talented pastry chef with a very special gift who opens a bakery in her hometown, with mesmerizing results. 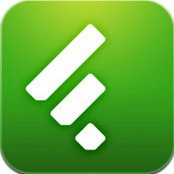 Visit Judith at her blog, Alfresco. 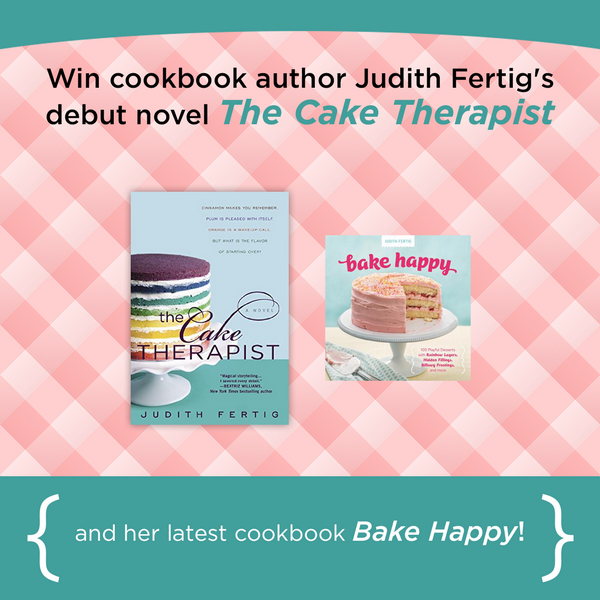 Win a copy of The Cake Therapist AND Judith’s brand new cookbook, Bake Happy. To enter, fill out the form below on or before midnight, Saturday, July 4th. Continental US addresses only. For an extra entry, tweet or blog about the giveaway. The winner will be contacted by email and have 48 hours to respond. This seems like an awesome duo giveaway. Love that the books are together -what a fun package. This book is on my TBR and I love that the giveaway includes a cookbook! Great giveaway and i liked your review. This has been on my to-read list! What an awesome giveaway. If I didn’t already have both books, I’d be all over this. 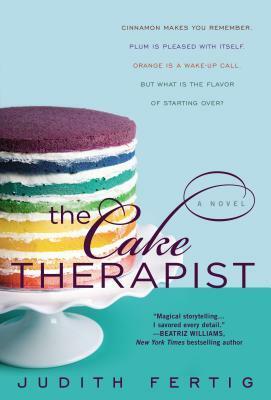 I haven’t gotten around to reading the Cake Therapist yet … must bump it up! Great giveaway – thanks! This book has been everywhere lately… looks like fun. 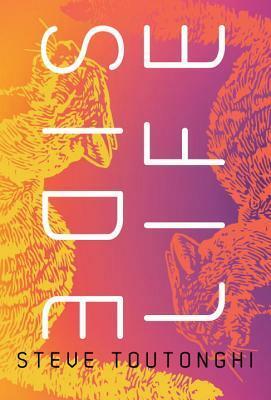 The cover of this book just makes me happy looking at it. I hadn’t heard of this author or her books before! I’m going to leave the giveaway to others because I don’t do much baking with regular flour anymore, but I’ll look for the novel! 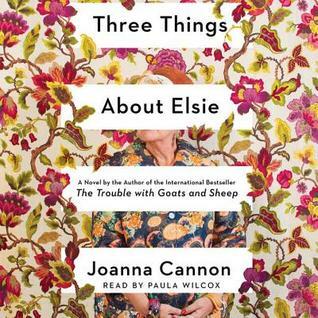 Sounds like a really enjoyable book, and how great to host a giveaway! It would be lovely to win, but I’m going to add it to my wish list, too. Thank you!